Don’t let your new home……. Look like an old home. These feelings are not uncommon for new homeowners, so rest assure you are not alone. Angels Landscape and Suburban Sidewalks has been helping New Jersey homeowners develop sensible approaches to planning your landscape and then executing the project in a way that fits both your vision and budget. Here are some basic guidelines to keep in mind during the thought process. First, what role do you want your yard to play? A space for entertaining people? Such as an outdoor living environment, perhaps a firepit or fireplace. Maybe an outdoor kitchen. Maybe, it’s the complete opposite and it’s a tranquil space for solitude? Other things that you must consider are style and the seasonal use and seasonal interest you would like to see. Then it’s your budget. As with designing your new home, a budget is critical to making your dream yard a reality without needlessly blowing through money. Another option is discovering the ‘bigger picture’. Having what is called a master plan allows you to have a big picture look at all the potential hardscape and landscape features for your new home in one plan. A master plan is a great way to phase landscape projects over a longer period of time. All good landscape and hardscape work happens with good planning. Hardscape features like decks, lighting, pools, fountains and walkways should go in first. Then, build around them with foundation trees and shrubs. 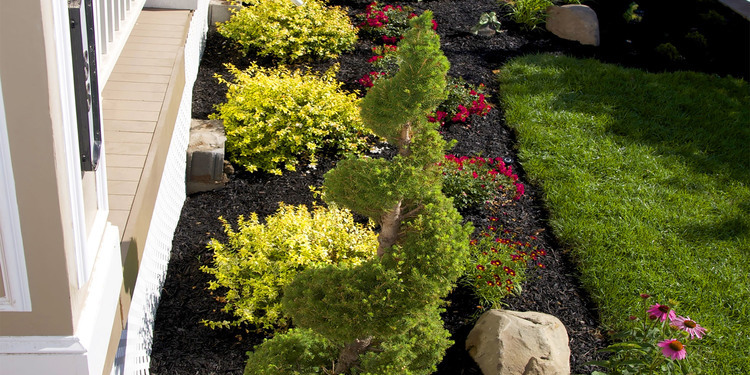 These take some time to get established, but in the meantime, you can augment them with seasonal color and accent plants such as perennials and groundcovers. The experts at Angels Landscape and Suburban Sidewalks can make recommendations that will help you turn your vision into reality. Again, sticking to a plan and a budget will keep you from getting overwhelmed when you’re walking your property on the next sunny day.